Yesterday was the Community Foundation Grey Bruce Annual General Meeting and Fall Granting Celebration. Our executive director, Francesca Dobbyn, was invited to attend the afternoon at the Grey County Administration Building in Owen Sound. Throughout the afternoon, the Community Foundation provided grants to various non-profits to support a variety of goals across Grey Bruce. 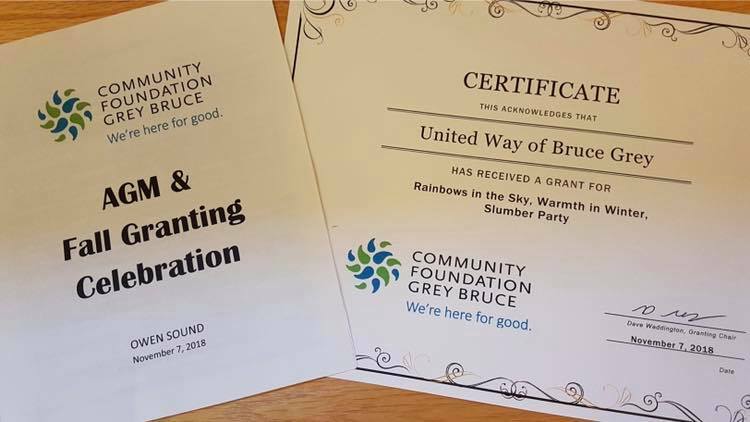 The United Way of Bruce Grey was honoured to receive three separate grants to further support our programming. The first grant we received was for ‘Rainbows In The Sky’. Rainbows In The Sky is an initiative to support Grey Bruce Pride and the LGBTQ+ community. Money received will go towards purchasing Pride Flags that will fly across the area in many different municipalities. The Warmth In Winter grant will continue the strong work we do through the ‘Hope For Our Kids‘ campaign, and provide warm winter outwear for children in Bruce and Grey. The ability to play in the snow without suffering is an important experience for all kids in Canada, and we are excited to make it possible for children living in poverty. The final grant we received was for the ‘Slumber Party’ program. Having a clean, comfortable bed is important for people of any age. A quality night’s sleep leads to a productive day, which can lead to further success. With this grant, we will be able to purchase new beds for low-income families in the area. We have so much appreciation for the Community Foundation Grey Bruce. After a successful Random Acts of Kindness Day on Friday, we are excited to continue working with the Foundation on all endeavours, and look forward to future success. The United Way of Bruce Grey continues to help and provide for many across Bruce Grey. Please consider donating today to further support our goals.